The Belgian Biodiversity Platform promotes and facilitates the creation of database-derived scholarly papers. A “Data Paper” is a paper intended for publication in a scholarly journal and describes a dataset or a group of datasets. A data paper describes data in a structured, human-readable form and brings the existence of the data to the attention of the scholarly community. Any scientist in possession of an interesting dataset is invited to publish data with the help of our Integrated Publishing Toolkit (IPT) developed by GBIF and made available through the Belgian Biodiversity Platform. If the metadata is properly described in the IPT, it may constitute the perfect draft for a data paper. A data paper differs from a research paper: it does not describe research. It describes the complete workflow used for creating a database and its contents. The idea behind is that if researchers want to use published data, they should have exhaustive metadata available so the data in the published database can be understood correctly. On the other hand, a data paper gives credit to the researchers, curators, developers... who developed the database and who invested efforts in the creation of the resource. It also constructs an easy way of citing data which was created by third persons. Further, a data paper informs you on how the data may and can be used, what license the data holds (we prefer CC0), and what sampling methods were used. 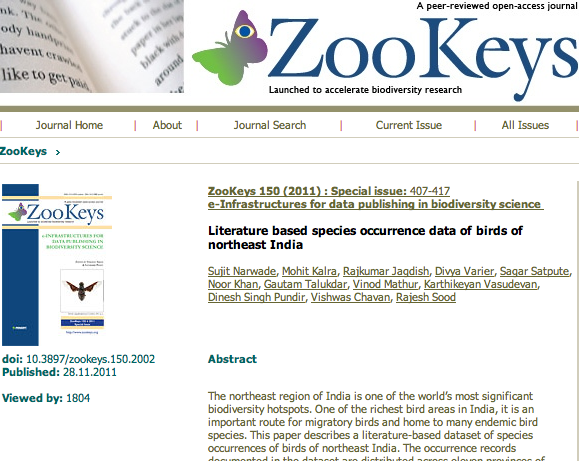 It also contains information on the geographical scope, the temporal scope and the taxonomic scope of the data. It can also explain some of the irregularities which can be found in the data, points you to similar datasets and gives you bibliographic references for articles already based on the published dataset. Acess our template for data paper! The Belgian Biodiversity Platform promotes the use of Data Management Plans to ensure that researchers working on a specific project have made clear decisions on how their collected data will be handled during and after the project. Such document guides you on data management, data preservation, metadata, publication, licensing, versioning, repositories, responsibles of the data, etc. On the long run, a Data Management Plan does save considerable amount of time. Moreover, more and more funding agencies now require a Data Management Plan to ensure that data is findable, interoperable, accurate, complete, reliable and reusable; and to minimise the risks of data loss. Other benefits are numerous, including the fact that data can be shared and understood by one and all throughout the world once it has been published online. If you have any question on data management plans, we can provide more information on the usual contents of such document. For more information, please contact Dimitri Brosens. The Belgian Biodiversity Platform promotes and uses open access, open code and open data. We share our tools and technologies developed in the context of our work through https://github.com/BelgianBiodiversityPlatform. We also provide advice to organisations developing Open Data Policy. For more information, please contact Dimitri Brosens. As Belgian scientist, you may avail of our Integrated Publishing Toolkit. If you wish to discuss biodiversity data and biodiversity informatics matters online, join our online forum! If you wish to receive support in the creation of data paper, data management plan and/or open data policy, please contact Dimitri Brosens﻿.